The king of pump, L-Citrulline can increase nitric oxide production and reduce fatigue during and after workouts. The most powerful and most popular pre-workout on the market, Caffeine is what takes your workout to the next level. Are you ready to experience the revolution in pre-workout supplements? Then prepare yourself for Myonox 2.0! Myonox 2.0 is a cut above other pre-workout supplements and is made with the highest quality ingredients. Myonox 2.0 uses two times the amount of potent ingredients of other supplements! It also helps endure your most intense workouts. With Myonox 2.0, you’ll notice an immediate difference in your workouts and find yourself getting the results you want faster than you thought was possible! The production of nitric oxide can have real effects on muscle pump, blood flow, and hormones being released. The N.O. cycle and supplementation will give you great pumps. 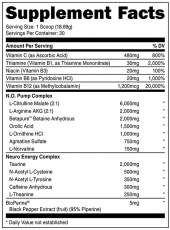 L-Arginine and L-Citrulline are the signalers to release N.O. into the bloodstream and cause vasodilation allowing delivery of nutrients to the muscle during and after your workout. Overall, very good! The energy boost is insane, but not too much. It’s not like an energy drink, where it just loads you up with sugar and stuff, to give you a burst of energy. This gives you strong consistent energy, that really helps your focus too, for a long time (depending on how much you drink). I usually do my workout in the morning, so this stuff really helps wake me up. When you’re lifting, you’re gonna see/feel a huge difference. What this type of supplement does, is open up all your veins so more blood can flow through it, and more effectively. What that means, is your blood will also carry more oxygen throughout your body, and to your muscles. More oxygen will, obviously, then give you more/heavier reps, and faster recovery times. Or, if you’re running/biking, you won’t get tired as fast. The only downside to this, and probably mostly every other brand, too, is the pressure the mix makes. When I mix it up in my shaker bottle, I have to open the bottle after about every 5-10 shakes, to let the pressure out, so it doesn’t explode. Along with the pressure in the bottle, it can (and probably will) make some pretty uncomfortable pressure in your stomach. When I first starting using it almost a year ago, I wanted to puke for about the first week. But, there’s a way to get around that. If you’re just starting to use this stuff, start with only about 1/2-1 scoop, instead of the full 2 scoops, and gradually move up from there. It doesn’t completely fix the problem, but it does make it easier. Once your body gets used to it, you’ll have no problems. Performance wise, it’s a 5 star product. But, because of the pressure it creates, I felt like I should knock off a star (I wanted to give it 4.5 stars, but I guess you can’t give halves). This is by far my favorite nitric oxide booster I’ve ever had, and I’ll continue to use it until I find one that’s easier on the stomach. I’d recommend it to anyone looking to get a boost for their workout, and lift to closer to their full potential. I have always been skeptical about these preworkout supplements but after using Myonox I have no more doubts. The improved energy and strength that I have had since using Myonox has made such a difference that I don’t workout without it anymore. This stuff really works. Improved strength, increased energy, and reduced recovery time. Enjoyed the boost in energy and it does seem like my muscles have been able to last longer during workouts. It’s worth trying. Really good stuff for someone trying to increase there strength and overall muscle mass. My workouts have improved dramatically with this preworkout. I have always used protein as a supplement but this is the first time that I have used a preworkout supplement. I would recommend it to anyone who is looking to get a boost in their workouts. Lots of energy without feeling all itchy or twitchy! No headaches or whatever, it pushed me through my workouts and I got the best work at the gym. The taste was awesome. Really liked Myonox. I’ve taken quite a few pre-workout supplements and Myonox definitely did the trick. I felt great mental focus after taking Myonox and kicked in right at the right time during my workout. It helped carry me through the whole workout session. Also, felt a big boost in strength and that “pump” everyone always talks about. The kicker was that Myonox had the best taste of any other pre-workout that I’ve tried and mixed fairly well. Only downside was after taking, it didn’t really digest very well. Great pump.Good energy not insane.Able to focus much better. Is this product good for women? Myonox is a good product for women (and men) who are looking for a supplement that will help to amplify their workout. However, if you are pregnant, nursing, or may become pregnant, you should not use Myonox. This product does exactly what it says , great energy insane pumps and vascularity . I totally recommend this product. So no artificial sweeteners in this product? 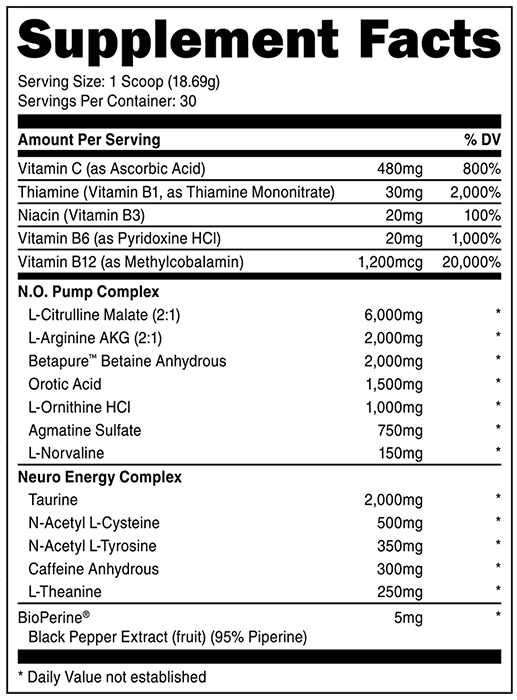 Looking at the “Other Ingredients” at the bottom of the supplement facts of Myonox, there are two artificial sweeteners used within its formula. They are Acesulfame Potassium and Sucralose. While Acesulfame Potassium is a third of the sweetness that Sucralose provides, they are both sweeter than sucrose which is common table sugar. Both are free of calories and, when blended together, produce a more sucrose than artificial taste to make Myonox a treat for the taste buds. Says it contains caffeine, but I couldn’t find where it stated How Much Caffeine? On the label of Myonox, under the “Neuromuscular Complex” list of ingredients, you can find Caffeine Anhydrous listed at 200mg per serving. Caffeine Anhydrous is just the dehydrated form of caffeine – meaning it has no water. About 200mg of Caffeine Anhydrous can be found in 1 cup of coffee depending on how it’s brewed. This product does everything that it says it will. I have never used a nitric oxide supplement before and all I can say is WOW. The directions said that some people bodies will require some adjustment time to it by only using half a scoop the first few times. I used a full scoop right from the start and have had no trouble adjusting to it. . The directions say to take it 20-35 before a workout. I can tell when it is ready when my skin starts to itch ever so slightly. If this is the only “side effect” than this product is as close to perfect as one can be. Exceeded my expectations. I had more energy without jitters and was able to up my weight on all exercises. Since Myonox has about 200mg of caffeine in it, can I take it twice a day, like in the morning and then in the early evening, like well before I go to bed? According to the instructions on the label, you can take between 1-2 scoops of Myonox as long as you do not EXCEED 2 scoops within a 24-hour period. So, taking it in the morning and early in the evening may be an effective way to take Myonox. Eating three, is not available? Re: Eating three, is not available? An option to purchase Myoswell, Decacor, and Myonox as a bundle is not available. However, Myoswell and Decacor can be bought as a bundle through the Creatine Supplements Kit. Myonox will need to be purchased separately. Gives you a great pump,doesn’t give you the shakes or the itchingness so it lets you focus. Not really interested in the increased energy but the pump is the best I’ve felt of any NO product. If they have one with only NO, I’d prefer that but this works excellent. Flavor is great. Best pre workout i have taken. It does not get me too jitter before my workout and i get a great pump from it. The BAAC really helps me recover when i do cardio. Great purchase I will buy this again when i run out. L-Arginine is a precursor to the synthesis of Nitric Oxide. This means that L-Arginine influences the function of Nitric Oxide. Products that have L-Arginine are generally designed to stimulate the production of Nitric Oxide. Products that have Nitric Oxide are typically designed to provide more Nitric Oxide to your body bypassing the process that usually occurs with L-Arginine. This is a great product and everything they tell you about this product is true!! Great pump and keeps you focused the entire workout!! 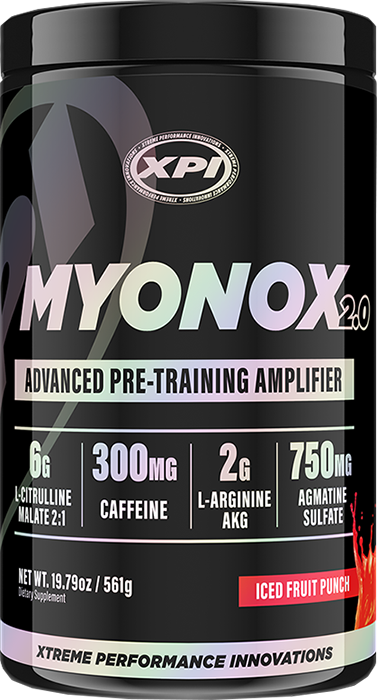 Myonox 2.0 is actually a good product, right up there with every other pre-workout. The reason i gave it 3 stars is because the new formula is no where near as good as the previous version of Myonox. I will continue to purchase as it is a good product, but i am disappointed with XPI for changing a great product just because it is more profitable for them. Oh well i guess that is business. First off, this preworkout tastes excellent. I got the watermelon and it’s great. Before I tried this PW I’ve been using Transparent Labs Pre-bulk and this is very similar in performance but tastes better and is cheaper. I will continue to purchase this great preworkout! I’ve been using 1/2 a scoop of Myonox for the past 2 weeks. Hadn’t used this type of product in quite a while. Half a scoop does make my face flush a bit but it’s tolerable. This product does give me energy for my workouts and it hasn’t made me jittery. I’m going to continue to use it and will eventually work up to a full scoop. Good investment. Will probably purchase again. Had never tried a pre work out before but this one is great. After working a 10-12 hour shift then going to the gym is a tough job. There is no energy left. But I started taking this and it’s like I’m full of more energy then I could ever use. Right off the top by bench went up 20 lbs and was able to do more reps. Highly recommend this. I’ve been using preworkouts for a while now and the last 2 products wound not do the job. I would take 1-2 scoops and feel sleepy. Myonox was what I was looking for, the energy boots, the focus that keeps you going on and on. What I also liked about it is that you do have a down effect after it’s gone. Really liked it, I’ve been using it for the past 6 month. Highly recommend it. Myonox 2.0 is a powerful pre-workout supplement that helps to improve your workouts, thus improving strength, endurance, and overall gains. Mix 1-2 scoops of Myonox 2.0 with 6-8oz of cold water. DO NOT EXCEED 2 SCOOPS IN ANY 24-HOUR PERIOD. DO NOT USE MORE THAN 5 DAYS DURING ANY 7-DAY PERIOD. Exceeding the recommended use or not following usage directions may lead to undesired effects. Not recommended for persons under the age of 18. Consult with your physician before use. Do not use this product if you are pregnant, nursing, or have any medical condition(s). Discontinue use two weeks prior to surgery. This product contains caffeine and should not be used with any other caffeinated and/or stimulant containing products. This product is intended for use by healthy individuals only. Too much caffeine may cause nervousness, irritability, sleeplessness, and occasionally rapid heartbeat. Do not use if packaging has been tampered with. Store in a cool, dry place. KEEP OUT OF REACH OF CHILDREN. Arginine AKG – Arginine AKG (Alpha-KetoGlutarate) stimulates amino acid synthesis and protein production in the body in order to boost muscle mass and strength. Not only does it improve muscle size and strength, it speeds up results. Citrulline Malate – Found in common fruits like apples and melons, Citrulline Malate is a non-essential amino acid that facilitates numerous functions in the body. Citrulline malate increases in plasma levels of Arginine to support greater protein synthesis for muscle development. Q. What Can I Expect From Myonox 2.0? A. When taken before your workouts, Myonox 2.0 will increase N.O. production, provide you with sustained energy and stamina, delay muscle fatigue, decrease recovery time, build lean muscle mass, and deliver a pumped up physique. Q. When Will I See Results with Myonox 2.0? A. Many Myonox 2.0 users notice a difference in the intensity of their workouts after just the first use. Your results may vary, but depending on your diet and lifestyle you should expect to see results with Myonox 2.0 within one week. Q. Is this product just for bodybuilders? A. No! Although this is a great supplement for bodybuilders Myonox 2.0 is for anyone who wants to gain more muscle mass and improve themselves physically. Whether one works out in the gym for general wellness, a specific art, or bodybuilding this product is for you. Q. Will Myonox 2.0 Deliver Results if I Don’t Work Out? A. The ingredients in Myonox 2.0 will provide your muscle with nutrients needed to grow bigger and stronger. But, results will be minimal without a healthy diet and regular exercise. For best results, use Myonox 2.0 in conjunction with a healthy, balanced diet and rigorous exercise plan.